With my birthday December 26th, I like to imagine Christmas season as a nearly month long celebration of friends and family. It’s by far my favorite holiday and there’s so many crafts to do! Despite absolutely failing at most crafts I try with my boys, I do manage to have a few successes. This tie-dye method I made up is my favorite way to decorate ornaments by far. Since I’m not a crafter and I had to modify the recipe a bit, I’ll share how I did it with the hopes of learning from others how to improve for next year. I’ve included affiliate links to make it easy for you to purchase some of the items I mention, but most of the stuff you can buy cheaply at your local grocery or craft store. Choose a base for your ornament. 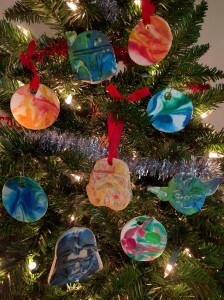 Last year, I made both flour-salt dough and baking soda-cornstarch ornaments. This year, I tried them both again. 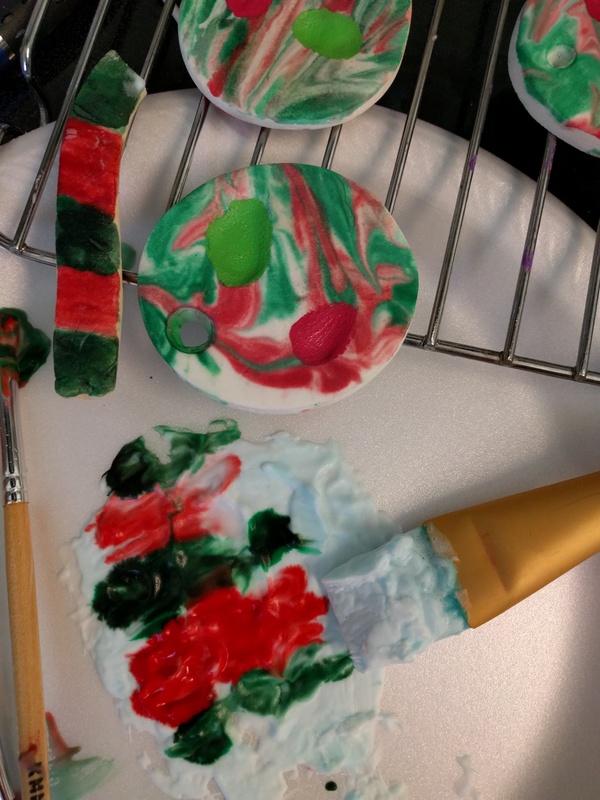 Unfortunately, I screwed up the flour-salt dough ornaments so they were puffy, crumbly, and dry. If you run out of table salt, don’t try to substitute ground up kosher salt. 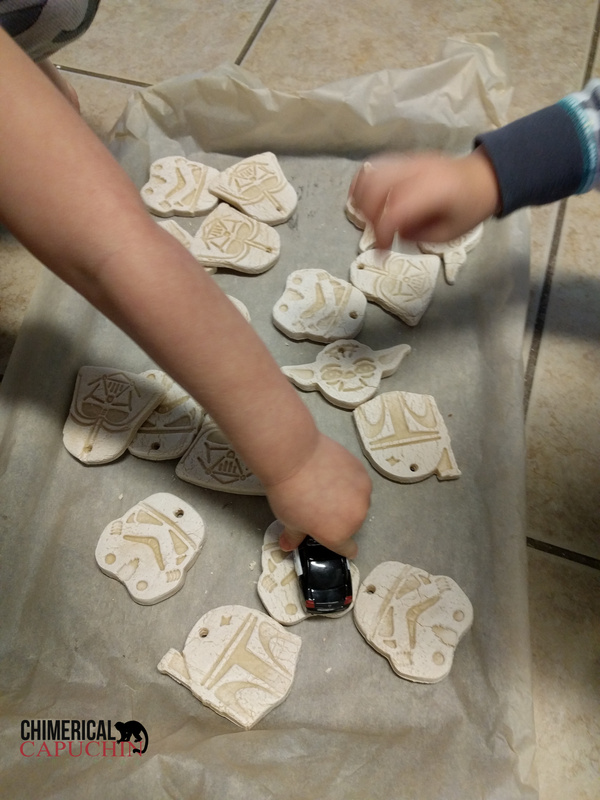 My boys still loved the Star Wars ornaments we made and I much prefer the flour-salt dough for plunger cookie cutters and toddler-made crafts. If you don’t screw it up like I did, it’s sturdier and hides imperfections better. How they are supposed to look when you don’t screw up the recipe. Which you mix in a pot and then stir over medium heat until it starts to look and feel like mashed potatoes. At this point, you transfer it to a bowl, cover with a damp towel, and let sit until cool. 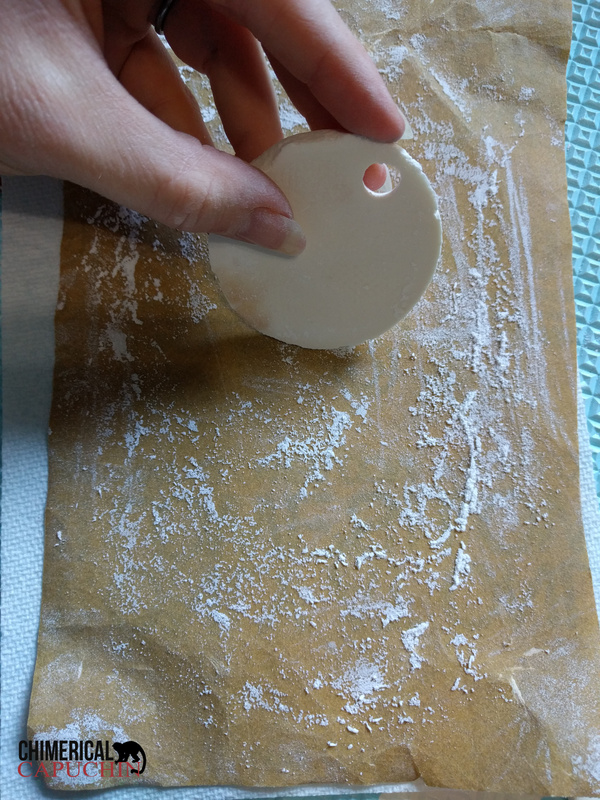 If you manage to do everything right, you can make pure white ornaments with this dough, but it’s much more sticky than the flour-salt dough and also catches imperfections easily. Lots of recipes tell you to bake the ornaments as well, but I found that when I baked them, even on low heat, they turned a bit brown and bubbly. Next year, I’m going to let them sit out two days. Some people mentioned letting them sit out one day, but one wasn’t long enough here in this humid environment. You can sand off the imperfections! 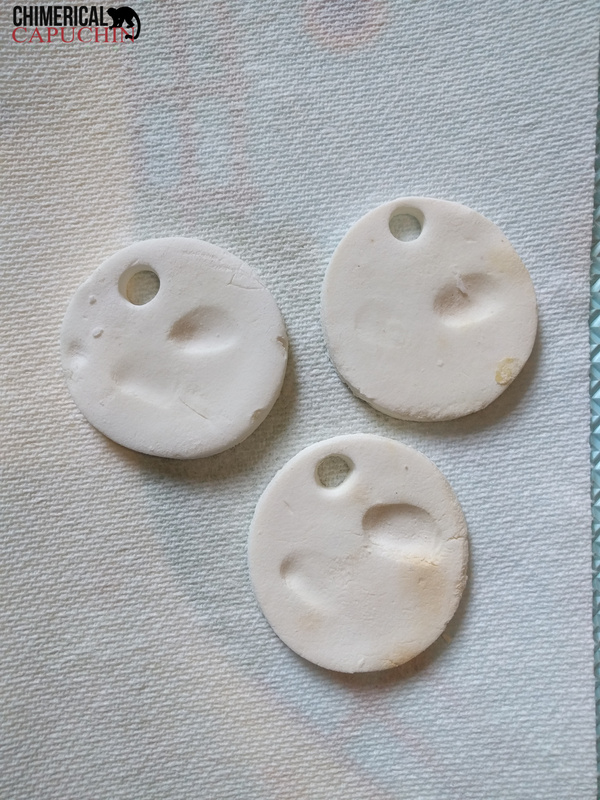 I wish I hadn’t decided to make ones with thumbprints in the ornaments this year. 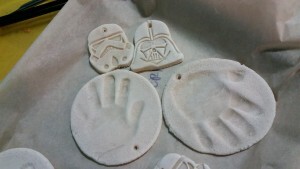 For one, my boys kept pushing their thumbs down into the clay and destroyed most attempts we made. When the ornaments did survive that, a lot of the thumbprints came off in the sanding. I grabbed these white foam stockings out of the discount bin at the end of Christmas season last year. In the mixture for just a second on the left. Left for a few minutes on the right. If you can’t find the shape you want in stores, you can always purchase the foam sheets and cut out your own shapes. 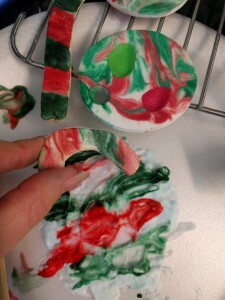 can also be used to make easy ornaments. 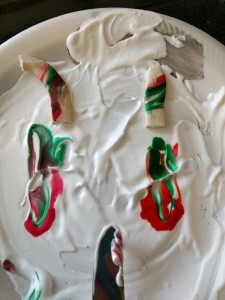 I was trying out different types of shaving cream with the candy cane. With cardstock, you can dye the paper, then cut out the shapes. Or you can cut out the shape and dye it. 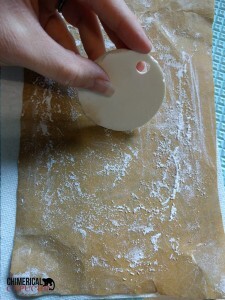 As you can see from the picture of it drying, it will bend a bit, so place it underneath a heavy surface and/or attach it to another surface that will keep it flat. 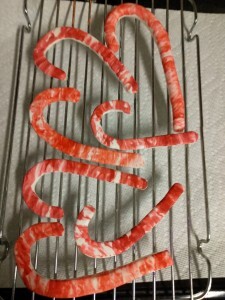 It’s a great way to make a ton of little things like candy canes, especially if you do each side separately and glue them together. Now you have your ornament. Neither of my boys are very interested in drawing or painting compared to their peers. My son Alden is too bouncy to sit still for that long and tends to get bored after about 3 ornaments, if that. His twin brother, Corwin, is very sensory sensitive. 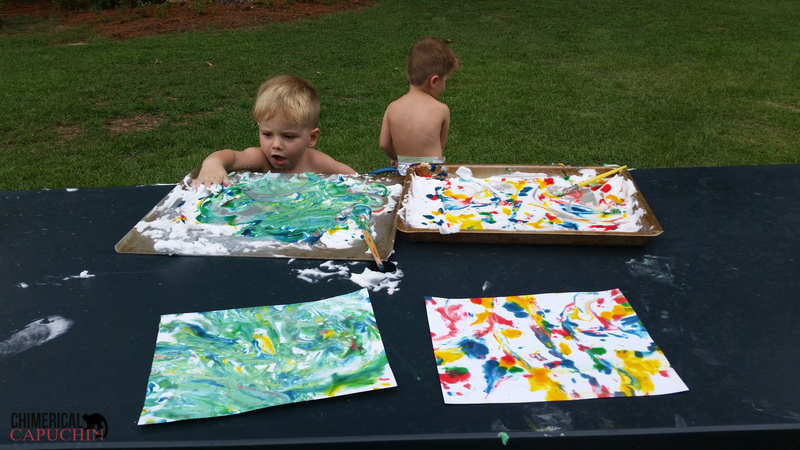 He refused to even try to paint for a long time and it took us placing the paper vertically to get him interested in painting. He still doesn’t like to finger paint and wasn’t keen on painting pumpkins for Halloween, so I wasn’t sure if he would even want to paint an ornament even if I somehow attached it to the wall. I was trying to figure out a way to meet his needs, when I remembered a craft we did this summer. 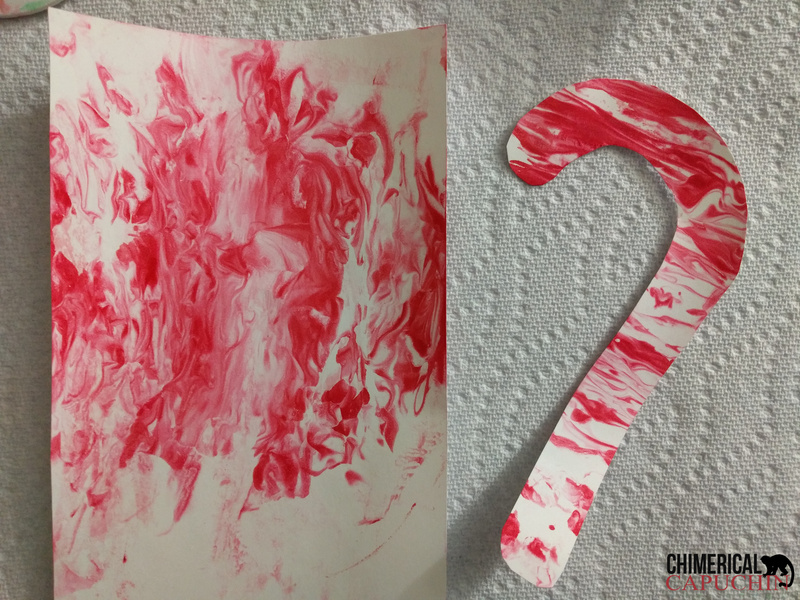 You spread shaving cream on the bottom of a pan, drop in dye, mix up the dye, and press cardstock over the artwork to transfer it to paper. Sensory seeking kids like Alden can mix up the dye with their hands. Sensory sensitive children, like Corwin, can use a brush, chopstick, or another device to mix up the shaving cream and dye. 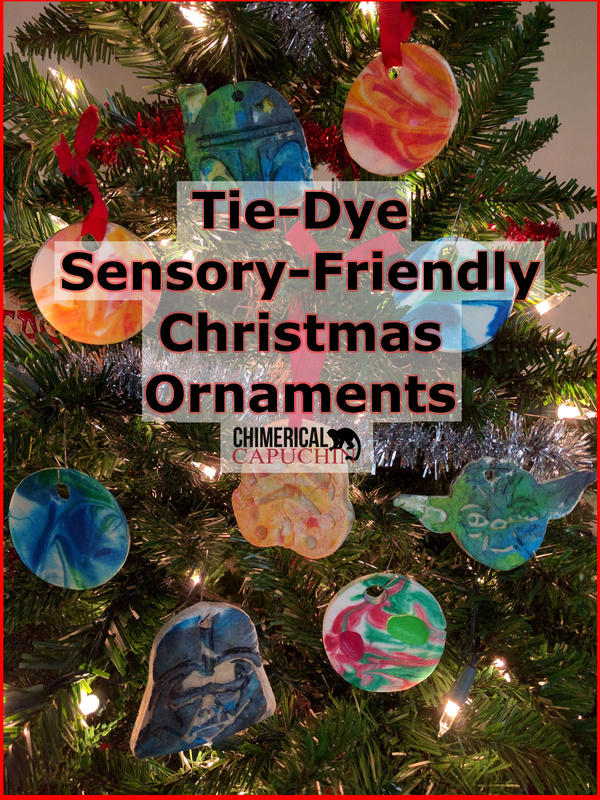 Making the ornaments is very similar: Spread shaving cream over surface, drop in dye, mix up shaving cream and dye, press ornaments into the mixture, leave for a short bit, then immediately press into paper towels. I didn’t get many pictures of the process because my son was way too excited and wanted to throw all the ornaments on the plate at once. 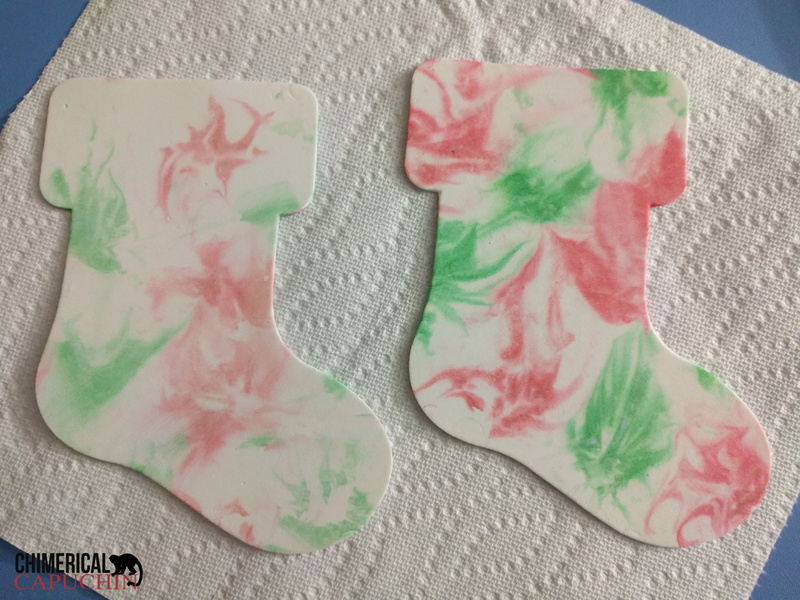 For the paper version of this craft, I was able to scrape off the excess shaving cream, but I found that scraping on the ornaments caused the colors to run. This didn’t matter so much with the boys’ individual ornaments, but red and green do not mix well, unfortunately. It also can cause strange patterns if you aren’t very careful about how you scrape. I love to use cardstock to blot the left over ‘ink’ after making my ornaments. I can use the cardstock for other projects. You can see how I wasn’t very careful with scraping. Instead of scraping, I pressed the ornaments into paper towels. To avoid wasting a ton of paper towels, spread the shaving cream fairly thin, although if you make it too thin, the colors tend to bleed together. Since Corwin is not a huge fan of touching shaving cream, I just had him drop in his ornaments. He enjoyed this and was able to stay mess free! This is the largest batch he’s ever ‘painted’ by himself. 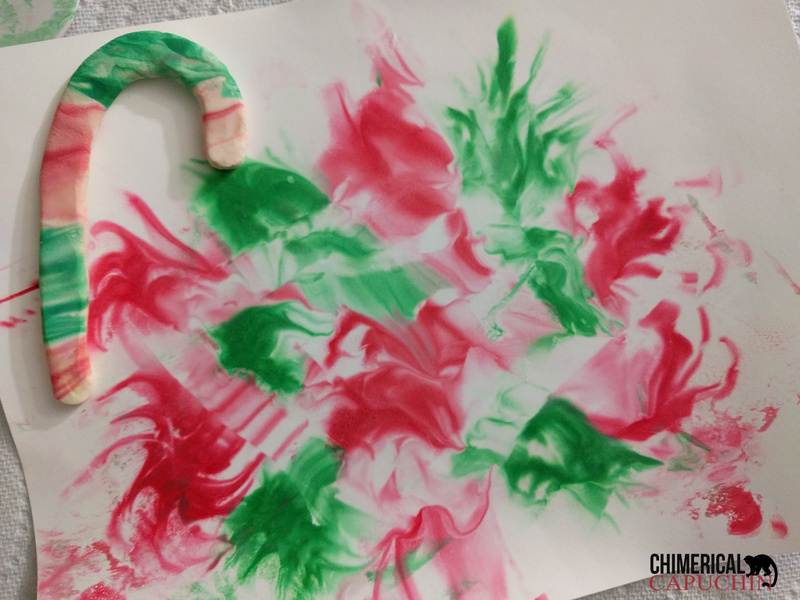 Experiment with different types of dye and shaving cream to get different looks. 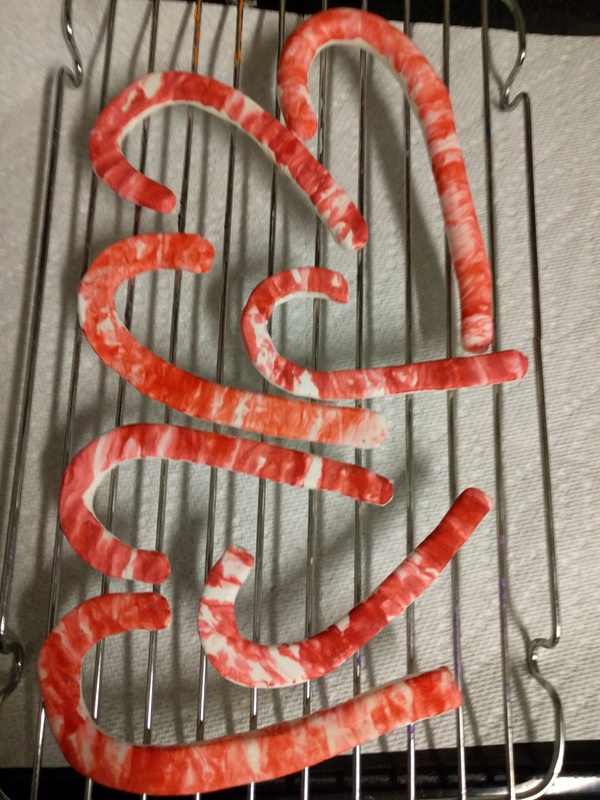 Since I had a lot of broken pieces of candy cane ornament attempts, I tried out both washable watercolor dyes and food dye . 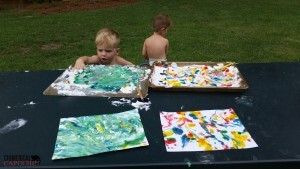 Washable watercolors on left. Food dye on right. This is also where I discovered that scraping causes the colors to run. The food dye left colors that were far more brilliant. 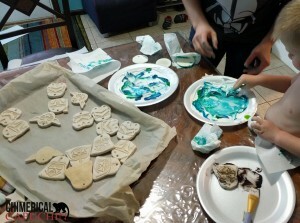 It is harder to clean up, so I suggest at least two adults per messy child if using food dye. I also ran out of my favorite craft shaving cream: Barbasol Original Thick and Rich Cream, which I normally get for under $2. I discovered that Edge’s Sensitive Skin Gel does a much better job of concentrating the colors, but it’s a lot harder to mix on the plate. Thicker shaving cream colors on the candy cane piece compared to cheaper shaving cream ornament. It seemed to work better for me to use a piece to soak up most of the top layer, then mix up what was left over, but overall, I found this very thick shaving cream difficult to work with. Third piece made from the mixed up dye. 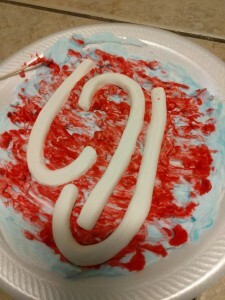 I tried stirring with a toothpick instead of a paintbrush to make my candy canes. But it didn’t give as much space as I had hoped. I think I put down too thin of a layer and I’m just not a fan of the thicker shaving cream, even though it left a more brilliant color. Ideally, I’ll find a cream somewhere in the middle. Seal to make it last. I don’t have a picture of this step because mine are still drying and I’m waiting for the rain to stop to go outside and seal. 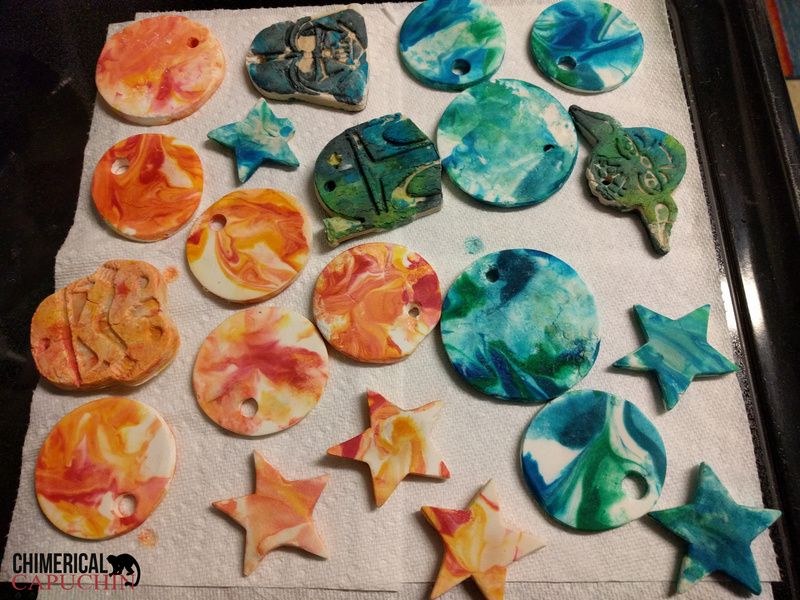 I like to use something like this Acrylic Sealer Gloss Finish to give the ornaments a glow and help them survive rough handling for years to come. Add string, ribbon, or an ornament hook. To show off the ornaments on the tree, I like to bend the upper part of the ornament hook to the side so that ornament faces out. There you have it! 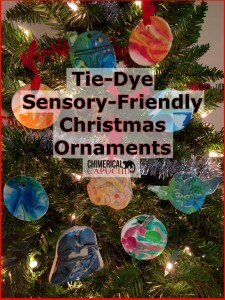 A great way to creatively decorate ornaments for sensory sensitive children. I’m sure that those of you with more crafting experience will be able to improve upon this method even more. If you try it out, please share your results and experiences! I’m still looking for that perfect shaving cream.